Mycosis fungoides is a T-cell lymphoma of low grade malignancy that most probably originates in the skin; it was described in France by Alibert as early as 1806. 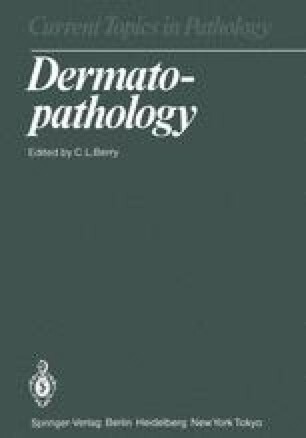 The skin changes are characterized by a sequence beginning with ecze-matous patches that develop into infiltrated plaques and terminate in ulcerating tumours; its natural course ranges from 10 to 15 years. Mycosis fungoides affects predominantly elderly people with a slight male preponderance. Although the term chosen by Alibert clearly is ethymologically and aetiologically a misnomer, it was rapidly accepted and is still used today. Dedicated to Prof. Dr. med. G.K. Steigleder for his 60th anniversary.